This year, International Women’s Day was marked by the Committee on the Elimination of Discrimination Against Women (CEDAW), with the adoption of a General Recommendation on disaster risk reduction in the context of climate change. The General Recommendation (GR 37) is the first interpretative guidance issued by a United Nations human rights treaty body to support States parties to understand and act on, the gender dimensions of disaster risk reduction in the context of climate change. The GR 37 calls on States to integrate a gender perspective within climate change and disaster risk reduction programs, to guarantee women’s equality, sustainable socio-economic development and climate resilience. On 15 March the Office of the High Commissioner for Human Rights, the Permanent Mission of Fiji and UN Women hosted a panel discussion on the new GR 37. H.E. Ambassador Nazhat Khan, Permanent Representative of Fiji to UNOG, moderated the discussion, with an introduction by Ms Nahla Haidar, Chair, Working Group on Disaster Risk Reduction, of the Committee for the Elimination of Discrimination Against Women. GI-ESCR’s Geneva Representative, Lucy McKernan also presented at the event, describing the GR 37 as a milestone and applauding its clear messages that climate change is not gender neutral and that climate change must be tackled urgently to avoid serious adverse impacts on women’s rights. The image below illustrates the “carbon countdown”, which is a visual representation of the numbers of years remaining before the carbon budget, associated with various temperatures, is fully consumed at the rate of the current global emissions. The GR 37 makes clear that women will suffer from climate change impacts more frequently and more severely than men, in part because they make up the majority of the poor, are more dependent for their livelihood on natural resources that are threatened by climate change, have unequal access to resources and decision-making processes, and often have more limited mobility. The longer we continue to delay emissions reductions, the costlier and less effective adaptation efforts will be, and the more women’s equality will be undermined. GIESCR is pleased also that GR 37 gives very strong and detailed recommendations on the importance of the meaningful participation of women in disaster risk reduction and climate change. The meaningful participation of women in all levels of decision-making on disaster risk reduction and climate change, including the level of political negotiation of global action on climate change, is critical for understanding the impacts and designing responses and solutions. With the GC 37 in place, the next step is to put it into practice. The Treaty Body State reporting procedures represent a real opportunity to raise awareness directly with States of the links between human rights and climate change and unpack how climate change impacts women disproportionately. To promote this work, together with the Centre for International Environmental Law, GI-ESCR undertook research and analysis on references to climate change in the State reporting procedure of the human rights treaty bodies. The research looked at all Concluding Observations by each of the treaty bodies up to December 2017. The research demonstrated a growing recognition amongst the treaty bodies that the effective protection of human rights requires States to take special measures aimed at addressing climate change and its consequences. Several interesting trends also emerged. Climate change has been primarily addressed by the human rights treaty bodies from the perspective of the need to protect vulnerable communities at the frontline of climate impacts. Therefore, most references to climate change in Concluding Observations have addressed the obligations of developing countries. For example, of the 28 Concluding Observations by CEDAW which address climate change, 25 have been addressed to small islands states and least developed countries. 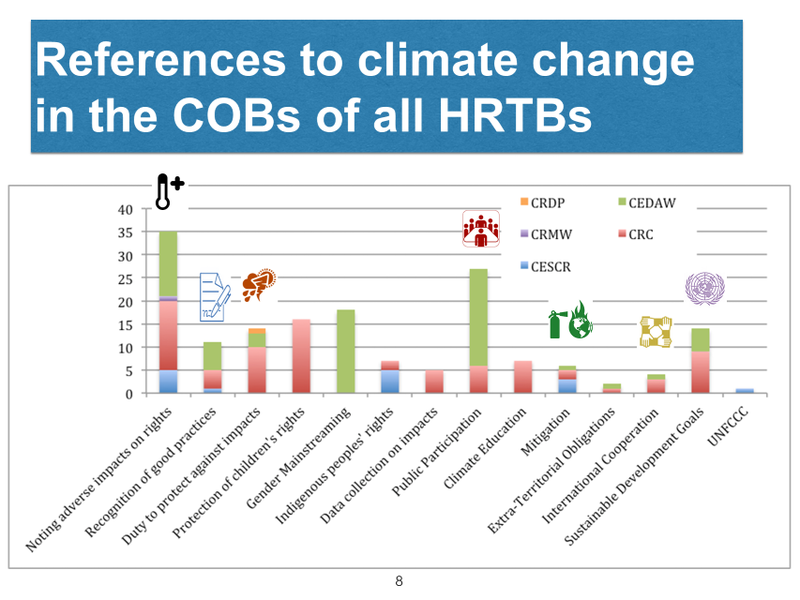 Further, in terms of themes, the majority of Concluding Observations frame climate change as a threat to the rights protected under the relevant human rights treaty. The second most mentioned topic was public participation, addressing the need to guarantee the effective participation of groups that are particularly affected by climate impacts and the importance of protecting the rights of these groups in climate policy. There are several themes that could be explored in further detail in the work of the treaty bodies. For example, it would be interesting to see more attention given to the role of developed countries and the situation of indigenous peoples, and to issues such as climate finance, a just transition of the workforce and a deeper understanding of the impacts of climate change on specific rights, such as the right to adequate housing, the right to food, the right to health and the right to life. The adoption of GR 37 is an exciting development in the field of human rights and climate change and we are looking forward to seeing how it is applied in practice at the local, national and international levels to advance women’s equality. Sign-up for regular updates on developments in economic, social and cultural rights at the UN, here. Want to learn more about States’ Human Rights Obligations in the Context of Climate Change? Visit our website for more details from our research.